It struck me on Friday evening that I’d eaten meat on six out of the last seven days. I’m a carnivore, that’s self-evident. I eat meat, and I’m happy to do so, as long as the animal is reared properly and its meat is of a good quality. I wring the most out of every piece of meat too, with things like chicken carcasses going into the stock pot, for example. Six out of seven is too much, and that was reinforced when I fell for one of those click-bait articles on the ten things to cut out of your diet if you’re trying to get really fit, which lodged red meat firmly at the top. This came as something of a surprise, and it seems a little counter-intuitive to me – anybody who’s ever trained hard for something like a marathon will know that they really, really need two things: loads of carbohydrates (also on that list), and plenty of protein, of which red meat is a superb source. Not as good as chicken, which itself isn’t as good as turkey, but good none the less. It was because of something to do with the fat content of red meat, I remember, but where’s the fun in lean beef or pork without its crackling? This led me to turn to the butternut squash that’s been waiting patiently in the fridge for rather too long. Could it become a meal that people would actually eat and enjoy, instead of meeting its usual fate of being sliced up and roasted in a hot oven until slightly too charred at the edges, slightly too hard in the center, and with slightly too much chilli in a vain attempt to rescue it? 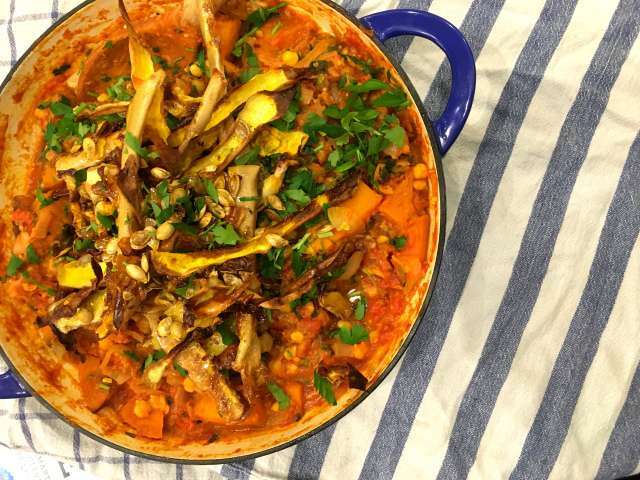 I hunted through my collection of cookbooks, which seemed a little bereft of good butternut squash recipes, and eventually found something in a Jamie Oliver book, a Sicilian stew that uses squash and chickpeas as the main event. Say what you want about Oliver, and many of you won’t hold back, I realise that, but I’d rate him as one of the most important cooks this country has produced in the last twenty years. I can think of few people who’ve done more to actually get people into the kitchen and cooking decent food than Oliver has, and that’s mainly down to his accessible and exciting take on food – his are recipes that people read and think ‘yeah, I’m going to cook that’. For that alone, he’s got my respect. So, this starts off with a butternut squash, about a kilo in weight. Peel the tough skin away, and then cleave the squash in half with your biggest knife, scooping out the seeds. 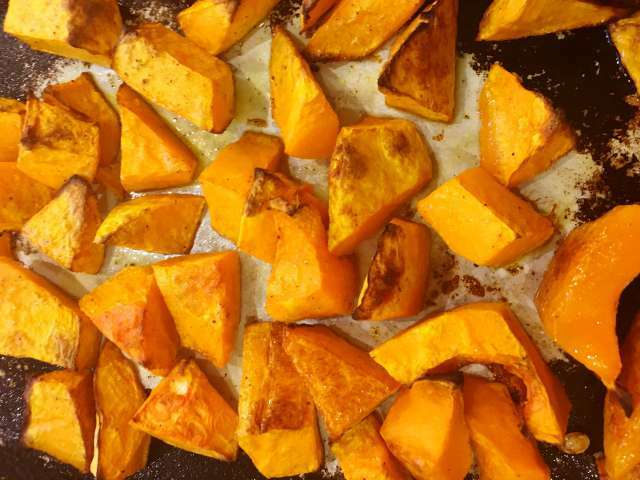 Put the strips of skin and seeds aside – they’re for later – and chop the squash into rough 3cm chunks. Splash the squash with a little olive oil, season it lightly and roast on a tray in a hot, 200c oven for about thirty-five to forty minutes, until the edges are starting to catch. As the squash cooks, peel and slice three onions and start to cook them slowly in a casserole dish (a cast iron pan of some sort is ideal) over a low heat. Add 40g of raisins or sultanas, the chopped stalk from a bunch of coriander, a teaspoon of cinnamon and half to one teaspoon of chilli flakes. Cover the pan and let the onions melt and start to caremalise. nudge them around every now and again, and add a splash of water if anything starts to stick. This will take at least twenty minutes. When the squash is ready, tip it into the pan with the onions, and add two cans of drained and rinsed chickpeas, two cans of chopped tomatoes, a tablespoon or so of tomato purée and 400ml of water (just fill one of the tomato cans up and add that). Bring the pan to a simmer and leave it uncovered for forty minutes for the sauce to reduce and thicken. As the stew cooks, spread the butternut squash peelings and seeds out on the roasting tray, splash some oil over them, season, sprinkle with a little cinnamon and some chilli flakes, and roast for ten to twelve minutes in the hot oven until crunchy. When the sauce has reduced, stir a handful of chopped coriander through the stew, and sprinkle more on the top. Pile the crisp butternut squash peelings and seeds in the centre and serve with couscous and plain yoghurt. This is adapted from a recipe in Jamie Oliver’s book Save with Jamie: Shop Smart, Cook Clever, Waste Less. Quite agree about JO, he has successfully encouraged huge numbers of people to cook for themselves with his no nonsense approach. This recipe (with variations) appears in a few places, I make it often, the butternut squash is my friend!